Another full weekend and another happy party. I feel like September has passed in a blur of entertaining and schedules but at least the weather has been beautiful, the company has been great and we’ve enjoyed plenty of good food and drink on the deck. I sat down outside Saturday evening to enjoy a quiet moment after the party but instead of picking up my book I went for my phone to snap a few photos of the flowers on our table. Posted as part of Lens and Pen by Sally’s Phoneography and Non SLR Digital Photo Challenge: Challenger’s Choice. beautiful and taken with an iPhone? The first shot gives the essence of a sunflower’s effect–joy, exuberance and wealth for the soul. Happy Photo Challenge. Picture summer flowers in fall’s hues. Perfect. Thanks, Andra. I’m always sad to see summer go but fall flowers help soften the transition. I agree September has FLOWN by, there was a lot of fun and good wine! Great flowers! Beautiful, rich colors … the perfect last-weekend-of-summer celebration! I’m glad you like them, D’Arcy! Love the vibrant, cheerful colour! Great photo with a lot of impact! I love the angle you have taken it from. Nice treatment. Care to share your technique? The feel is somber, autumnal and rich. I’m happy to share my editing choices, thanks for the question, Jann. 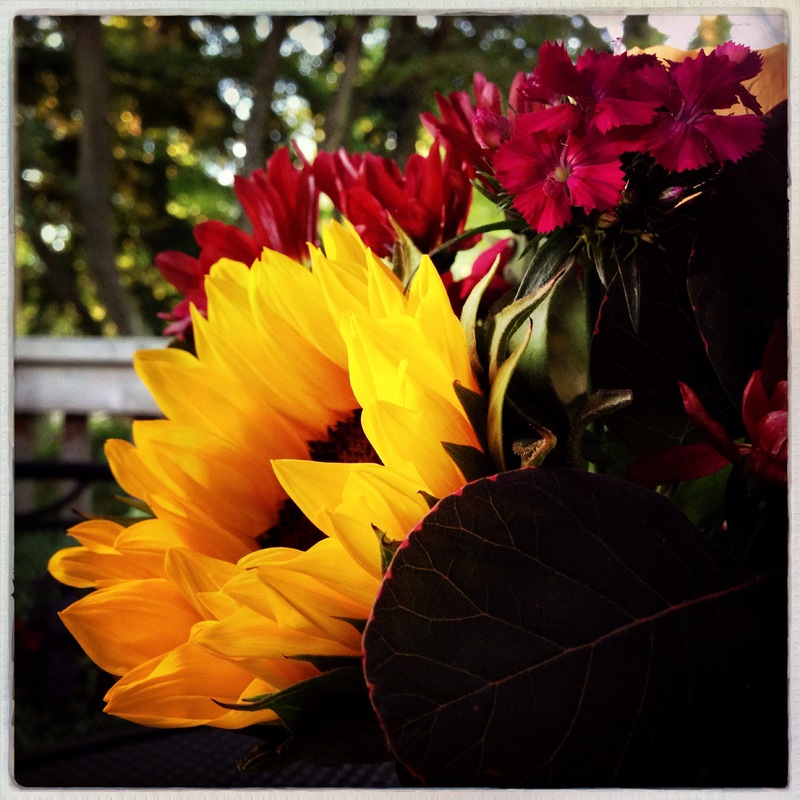 I took this shot with my favorite Hipstamatic lens/film combination for flowers – Jane/Robusta. Sometimes I’ll adjust the contrast and brightness a little in Snapseed later but this image is pure Hipstamatic. Hmmnn, maybe it’s time to revisit Hipstamatic! It fell out of favor with me awhile back. So many apps, so little time . . . thanks for sharing the tidbits that go into making a work of art. Love the angle you took, and you captured the lighting and color. Nice to hear, Amy. Thank you! such a cheerful moment. thanks for sharing. thanks for sharing 🙂 loved all the vibrant hues ! Perfect! Love the colors–speaks to me of autumn. I’m glad you like it, Naomi!